Well, if you read yesterday's post Shake, Rattle and Crash!, then you will know how disappointed I was with the module crossover at the end of the last adventure. It did not go smoothly at all. But enough of that, what else occurred on the night? Well, most of the evening otherwise went quite smoothly and you can catch up with the synopsis from the website as usual. Note, you gain a little more info about the "loose tooth" from the synopsis, as I realised afterwards that I should have reminded a player that their PC should have cast the "Tongues" spell and not the "Comprehend Languages" spell when trying to understand a foreign tongue. This is the subtle difference between these two spells, and so I have give the players the benefit of the doubt that this is the spell they would have cast, and so given them what they would have learned within the synopsis. 1) Hit points calculated for the Realm went wrong after the player refreshed their main menus because a variable set during transfer was based upon the PC they were controlling and not the PM (Player Mannequin). This meant a couple of things (number of attacks and hit points) upon arriving at the Realm would have been inaccurately calculated for the PM, which is considerably lower level than the PC it was supposed to represent. This was the main fix for 0.05. 2) During my trouble-shooting to find what had happened, I discovered an exploit in Soul Shaker regarding Soul Fragments and fixed that. This and a typo correction were the 0.19 fix for Soul Shaker. Note, I will not upload these to the Vault until we have played Soul Shaker to completion. Then I will upload all fixes that we found along the way. NB: These are very unusual and unlikely to be encountered bugs and so I am not worried by them. 3) I added new code to help ensure the lich conversation starts when you encounter it. Again, this is a redundant fix for Torén Norus, as we have now finished it. I just like to make sure it is fixed for my own satisfaction. Lastly, just to go back to the main crash that occurred. The only other thing that I could think of that may have been a contributing factor is that the level the module started in may have been too big for the game engine to handle across the Internet. In future, I will try to ensure all such module changeovers start in a small area by comparison, so that the game at least loads for all players before we start properly. 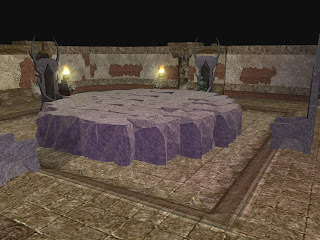 "A large round stone table stood in the center of the room, surrounded by four thrones: This was the ancient Meeting Chamber that the heroes knew lay somewhere within the tower, and now they had found it. Yet, as the stared into the chamber, a ghostly voice sounded in their heads at the same time as they spotted the emaciated husk of a humanoid being sitting in one of the thrones. Almost by instinct, the heroes knew they had found Terrell ... or what remained of him."